Home » Telugu » News » IPL 2018: Venkatesh Daggubati cheers for Sunrisers Hyderabad. Watch Video! IPL 2018: Venkatesh Daggubati cheers for Sunrisers Hyderabad. Watch Video! Venkatesh was seen in his best mood and happy while cheering for his favourite team. 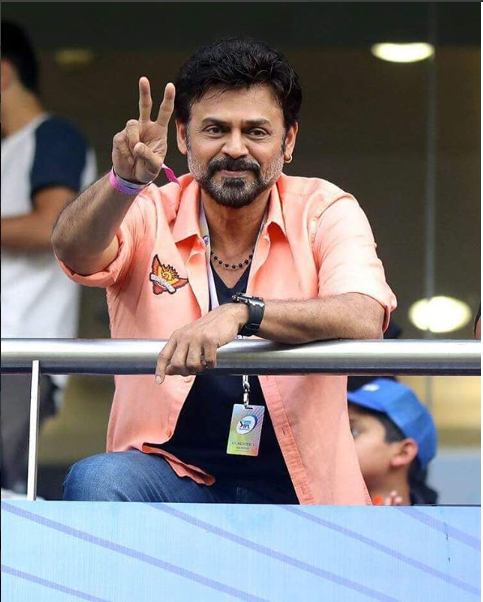 South star Venkatesh Daggubati was clicked at Wankhede Stadium to cheer Sunrisers Hyderabad in the first playoff against Chennai Super Kings of the Indian Premier League (IPL) 2018. The actor was seen in his best mood and happy while cheering for his favourite team. The actor came all the way from Hyderabad to Mumbai to support Sunrisers Hyderabad but to the much disappointment, Chennai defeated Hyderabad for the third time this season to storm into the finals. On the work front, Venkatesh Daggubati has geared up for the shooting of Anil Ravipudi’s F2-Fun and Frustration. F2: Fun and Frustration which is a multi-starrer with Venkatesh and Varun Tej. The film also stars actresses Tamannaah Bhatia and Mehreen in the lead role. This is for the first time that Varun Tej and Venkatesh have come together and this has created immense excitement among the audience. Reportedly, in an interview, Mehreen had shared that she had signed the film just to feel the sheer enthusiasm of what it means to be a part of Venkatesh-Varun Tej’ F2. Besides, Venkatesh Daggubati and nephew Akkineni Naga Chaitanya will soon be acting in a multi-starrer together which is said to be directed by Bobby aka KS Ravindra. This yet to be titled film may go on floors by end of this year after wrapping up their respective projects. Reportedly, Rakul Preet Singh has been roped in for this multi-starrer and will be paired up with Naga Chaitanya. Earlier this year, Anil Ravipudi took to Twitter and revealed that the shooting of the film will go on floors from June. He shared a selfie picture with Venkatesh and Varun Tej as they locked the script the production house.